#MissiesPudInn Clubs are seasonal events I cook up to share with people the things I enjoy; puddings, building a brighter community and Sheffield. I can reveal today’s five puddings being served to our lucky diners joining us for Class in The Rutland Arms. A massive thank you to all our talented and generous Sheffield chefs, restaurants and bakers who all have been busy baking up a special menu to savour the taste of school puddings. One thing’s for sure, your sweet tooth will be happy today…. I’ve always believed it’s important to know who cooks the food you’re eating and that’s why I encourage the makers to sit in at the event with us. Today, I’m really pleased that Chef Lee and Chef Luke from Silversmith’s, Chef Mike and Chef Simon from the Showroom are all able to join us so please do say hello (and thank you) to them and let them know what you think of their courses. Yee Kwan won’t be able to attend as she’s busy prepping for her first retail stall in the Sheffield Indoor Markets but I’m sure she will be keeping an eye out for pictures and tweets. I also encourage Pud Inn diners to do lots of LIVE tweeting using the hashtag #MissiesPudInn and to share photographs online. 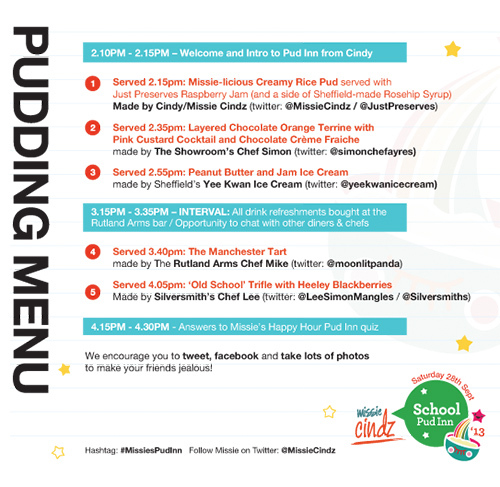 We’ll all be super busy dishing up school puddings so it’s always fun to check out your pictures afterwards and receive feedback :) – Make all your friends super jealous so that they want you to take them to the next Sheffield Pud Inn Club! There will be also a Twitter Pud Inn Competition with the Rutland Arms. Tweet and share your love for puds using the twitter hashtag #MissiesPudInn for a chance to WIN a complimentary hearty meal and drink at the Rutland Arms. Our most enthusiastic Pud Inn tweeter will be chosen on Monday. Today’s Pud Inn is also school fancy dress and there will be meal/drink vouchers for the best dressed school boy & school girl in class! A note to diners: feel free to bring tupperware as we don’t like to see delicious homemade goodness going to waste. Do make sure you try everything too but if you feel the waistband tightening, stop and take a break.